Hasbro’s Marvel Universe line has a bucketload of product out at the moment, and tonight I’m looking at some of their latest Comic Two-Packs, which are billed as “Marvel’s Greatest Battles”. There are two sets: Deadpool vs Taskmaster and Silver Samurai vs. Wolverine (Patch). These two-packs continue the trend of packaging one already done character (or a variant of one) with a must-have new character to the Marvel Universe 3 ¾” line. In this instance, avid collectors of the line have to buy another Deadpool and yet another Wolverine to get the new characters, but not only are Taskmaster and Silver Samurai well worth it, they are some of, if not the best figures Hasbro has done in this line to date. Deadpool and Taskmaster have a long history of a love / hate relationship, so this combination makes a great deal of sense. Deadpool has been done before in the Wolverine: Origins Comic Series, but this figure isn’t just a straight repaint. He has a newly sculpted head and hands, and I think his upper body may be new as well. I’d have to say I prefer the original figure for two reasons. First off, Deadpool’s black shapes around his eyes are much smaller on this version, and it makes him look funny. Secondly, his right pinky finger is sticking out for no discernible reason. The hand looks like it would be better suited to drinking a cup of tea than holding a weapon. Bizarre. Deadpool comes with two katanas, a knife and and a gun, and has holders and holsters for all of the above. He has a much less obtrusive holstering system for the katanas than the Origins figure, which is a nice improvement. I’ve only recently come to really know and like Taskmaster as a character (you can check out my review of Taskmaster: Unthinkable here), so this release was timely for me. This is quite an outstanding figure! This is a very nice use of some well sculpted custom pieces on the standard MU buck. His headsculpt is excellent, and his cape is a great piece of work. The figure has no problem standing up on its own despite the size and bulk of the cape. The paint work is very solid right across this piece. 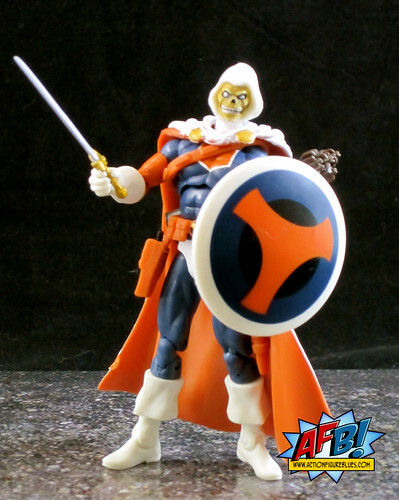 The two-tone cape looks fantastic, and the colour choices are perfect, really capturing Taskmaster’s comic book appearance. Taskmaster comes with a great range of accessories. He has a sword, gun, bow, quiver of arrows and his trademark shield. Most pleasingly, all of these can be kept “on board” - no extra accessories hanging around, which is just the way I like them. The shield is a particularly good looking piece with a very nice paint job. 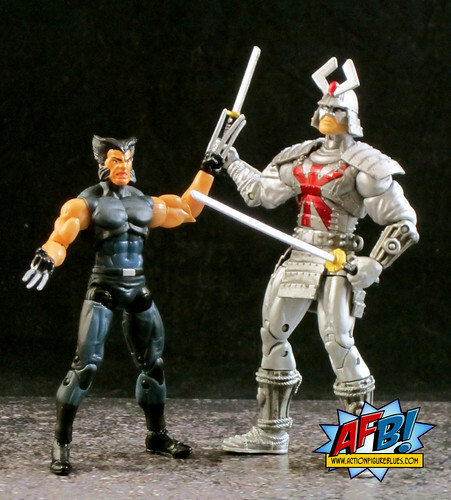 The Silver Samurai vs. Wolverine set is based on the very early issues of his solo series, primarily issue #2, where he fights Silver Samurai as Patch. It’s a shame that Hasbro went so far with creating a Logan in the gear he wore as Patch and then left off the patch. Without it, it’s another Wolverine. Seeing as this isn’t really Patch, I’m going to call him Ugly Logan, because this figure has been hit with the ugly stick in a very serious way. His nose is way too big and I’ve never been a fan of Wolvie’s big 90’s hair. He just looks silly. Being smothered at the bottom of the Black Hole Box of Accessories and Figures is too good a fate for him, really. In fact, the first person that asks for him in the comment section can have him, because he’s better off making someone else happy than annoying me here. Postage on me, anywhere. Hit me up. Thankfully, the sunny side of this two-pack is extremely sunny. 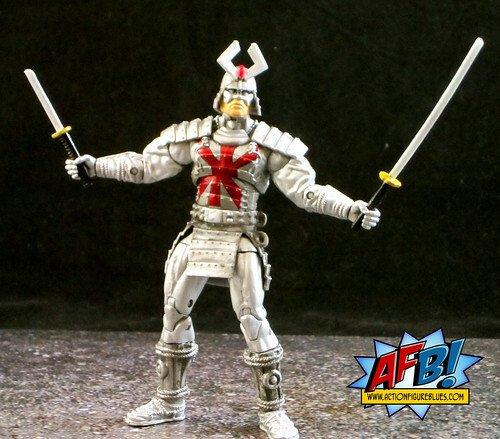 Silver Samurai is an amazingly sculpted and detailed figure for this scale. His armor is very nicely designed, and the use of raised detailing adds greatly to the texture, feel and of look of the figure. He also has some fantastic sculpting work on his lower arms and boots. I also love the fact that a hoop for storing a weapon is included on his belt - a very nice touch. Silver Samurai’s headsculpt doesn’t let the rest of the piece down - it’s also very nicely detailed. The entire figure is supported by a great paint job - the use of metallic red for his chest emblem really makes it “pop”. He comes with a selection of weapons with which a great deal of posing can be done. I would have loved to see Hasbro include a “charged up” weapon, since Silver Samurai often uses his mutant power of creating a tachyon field to make his katana even more deadly. Hasbro has done some great things with energy constructs in this line which would have worked brilliantly here, but one assumes that this was a costly figure to make without adding another extra. If he ever gets a single figure reissue, it would be a nice touch to add something like this! Obviously, I’d rather get two-packs with two new characters, but the low points here are easily looked over thanks to the fantastic job Hasbro has done on the two new characters in these sets. 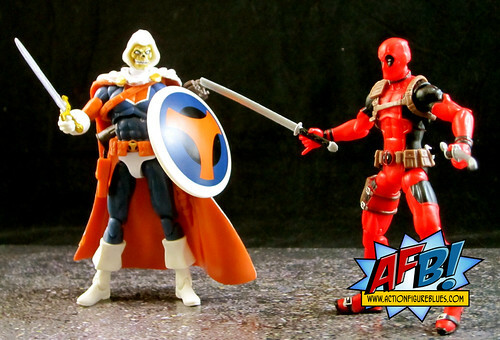 Taskmaster and Silver Samurai are most certainly both in the running for 3 ¾” figure of the year! You can see more pics at Facebook, discuss this at the AFB Forum, and you can comment on this post to enter the July AFB Comment of the Month Contest! I have seen the Wolvie/Silver set but i have yet to run across the Taskmaster one. i have actually passed on both these 2-packs, mainly because of Ugly Logan and squinty Deadpool... but great review. makes me wanna go back and get them for the new characters. maybe eBay will be kind to me... or not. Was avoiding this line until i snagged a Movie Cap Crossbones...on a related note,he's one of Taskmaster's graduates.Tasky gets a great figure here than the floppy mess his legends was,only thing I don't like is the painted on detail on his chest. The AFB Comment Contest for August 2011! Welcome our new sponsor, BigBadToyStore.com! Bowen casts a spell with The Enchantress! The AFB Comment Contest for July 2011!